Bombay Sapphire and the Tribeca Film Festival have once again launched the Imagination Series film competition. The competition was first launched last year in an effort to give five filmmakers a chance to have their own short film produced, using a script written by Academy Award-winner (Precious) – Geoffrey Fletcher. Check out all the “Year 1” winners (here). 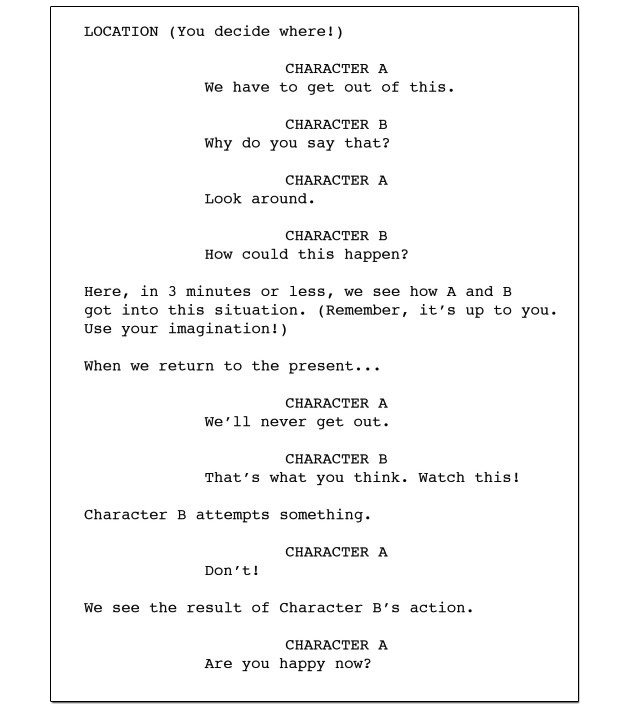 The following screenplay contains just the dialogue and very little description. You may imagine its characters, its location(s) and its events in any inoffensive way that you wish. You may add a scene in the middle with your own dialogue of up to 3 minutes in length. The dialogue for the beginning and end are set. The total film should be around 5 minutes in length. Your characters can be any combination of people, creatures or objects, real or imagined. Feel free to place these characters anywhere (Earth or otherwise), in any time period (past, present or future) or in any genre (comedy, thriller or otherwise) using any style or production technique (live action, animation, photography, drawing or otherwise) that you wish to use. When you come to enter your treatment you will be asked to enter a written overview (maximum 1000 words) and the dialogue for the central scene. Before you enter, be sure to see Geoffrey Fletcher’s Hints and Tips. You must enter ASAP because the competition closes on August 4 2013. Geoffrey Fletcher and Adrien Brody (plus other panelists) will then select their four favorite creative concepts. A public vote will decide the fifth winner. Then all five winning concepts will go into production and get to be presented at the Tribeca Film Festival in 2014!